Big Enough to Handle Any Job...Small Enough to Care! 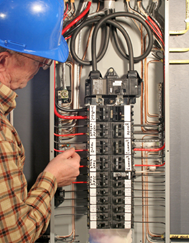 One of the best contractors in the business, Excel Electric, specializes in circuit panel upgrades. Our company provides complete panel upgrades in as little as one day. Taking care of all the permits, you can count on us to be professional and courteous. From homes under renovation to replacing panels incapable of supporting the power you need, we are your preferred electrical contractor. We also provide panel repairs and circuit breaker installation. Contact us in San Juan Capistrano, California, to learn more about our circuit panel upgrades and repair services.